In these days of having to pay extra to check a bag (remember when that was included? ), there are so many inconveniences to carrying on. I can’t bring my favorite perfume because there is no container small enough. I have to dump out my reusable water bottle and risk using the sketchy water fountains in the airport, or spend $20 on an overpriced, environmentally un-friendly bottle to stay hydrated. You have to bring about 20 travel size lotions to really be able to keep properly moisturized for more than a day’s trip. And, I recently had an artisanal fig and cinnamon jam confiscated by security because they probably thought it looked delicious, and apparently pastes/gels fall under that pesky 3oz restriction. But maybe not for long! There is a new machine in the works that would end the ban on gels, aerosols and liquids in carry-ons. It would be able to identify and catalog the type of liquid, aerosol or gel to separate out what’s safe (e.g., baby food), and what’s potentially deadly (e.g., homemade bomb), by using ultrasound and radio pulses to determine the material’s chemical properties and compare them to database of items deemed harmful. I, for one, and VERY excited. I’m not sure when posting pictures of your food became such a thing. I think it has something to do with a combination of things – the popularity of food/recipe blogging, the rise of being a foodie as a hobby, and the fact that most people carry a camera phone linked to instagram in their pocket. I happen to be lucky enough to live in a city where the food is amazing. I can eat Thai, Russian, French or American in any given week, and frequent places that specialize in making one thing awesome (think Potatopia, Rice to Riches, Taquitoria). At many a dinner, I have been interrupted-about to take my first bite- by a friend who wanted to take a photo of our spread, and promptly upload our dinner to the web for the world to see. Now this little habit we seem to have developed as a culture can help solve one of the world’s major problems, child hunger. Feedie, a new app will donate money to The Lunchbox Fund every time you take a photo of your food at one of the participating restaurants and upload it using their app. And the bonus? It’s totally free for you. The money comes from Feedie’s restaurants who cover the cost of the donation. The Lunchbox Fund will then translate your photo into real food delivered to school children in South Africa, and I have a feeling that if they get enough support they would expand worldwide. The best part is that it’s restaurants you (or at least I) would want to eat at anyway with participants including Babbo, Buddakan, Otto, The Spotted Pig, The Breslin, and tons more. Check out the Feedie site for the full list of restaurants participating, and go download the app already. Work towards helping people with something you’re doing already. It couldn’t be any easier! It’s a rare work day without a single meeting. When I encounter this lucky scenario, I cue up my soul pandora station, and plug away at my tasks to the tune of Etta James afternoon. It can make any work a breeze. Here are a few of my favorites. As anyone who has had a stomach ache from over-indulging in desserts knows, it’s easy to have too much of a good thing. Dr. Jennifer Tomlinson points out that the same adage is true for relationships, especially when openly praising your significant other. In research she completed in collaboration with academics from Brooklyn College, University of Rochester, and University of Waterloo, she found that when couples feel over-idealized in a relationship, it can cause problems. They measured over-idealization of traits (e.g., friendly, smart, helpful) versus abilities (e.g., social butterfly, athletic, excellent cook), and found that when a person felt they were being put too high on a pedestal by their partner, they created distance in the relationship. This negative effect was stronger for men who felt over-idealized, and when abilities (rather than traits) were over-praised. Check out the full article covering her research in The Vancouver Sun here. And, if you are interested in more research by Dr. Tomlinson, mosey on over to this post. Of all the pumpkin things that appear in stores this time of year, my favorite has to be the Reese’s peanut butter pumpkin. I prefer the Starbuck’s Christmas Eggnog latte to the #PSL pumpkin spice cult that has developed in fall. While I can have a Saranac Pumpkin beer and not dislike it, I would never pick up a six pack. I don’t love pumpkin bread, muffins, or pancakes. 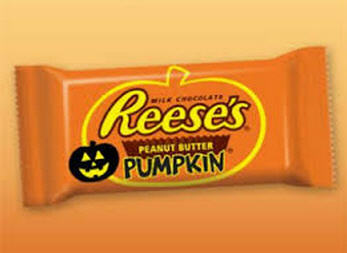 But when I see a peanut butter pumpkin by the register as I am checking out, I just can’t resist. I feel the same way about all of the seasonal Reese’s: the trees, the eggs. I watched a “How Its Made” episode about it once, and the reason these seasonal treats are so much more delicious than the regular cups is a more favorable (in my opinion) peanut butter to chocolate ratio. The pumpkins are packed with PB, with only a light chocolate coating instead of the ridged edges of the cup. Good thing they start putting Halloween candy out in September!